“All Stars Cricket” is an exciting introduction to the game for 5 to 8 year old boys and girls. 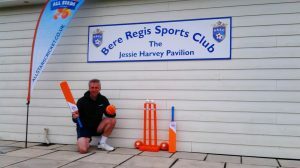 Bere Regis is one of the many approved All Stars Centres throughout the country, offering 8 coaching sessions on Sunday mornings, starting on 12th May this year. Applications have to be made through the ECB website, so click here to be redirected. For just £40, in addition to the 8 hours of fun sessions, each participant receives a personalised shirt, a bat, a ball, a cap and a kit bag, all items with All Stars Cricket branding! Lead Activator for the Bere Regis Centre is Andy Kent, a coach for over 30 years now, who also works in schools in the Dorchester area, teaching PE at all year groups from Reception to Year 8. Andy is backed by several other trained activators and young players, all of whom are currently taking GCSE PE or have completed a ECB Coaches Assistants course. Most important of all though, parents of participants are encouraged to join in during the sessions. Parents also receive emails each week with suggested ‘family activities’ to support the programme.